:: OnePageAfrica ::: Loud women On Rom’s Quiet Spaces! From Rom Isichie’s ‘Quite Spaces’, the works that make up the exuberant collection are not quiet after all. They are loud, bold and beautiful in all spheres as they rush before the eyes of admirers. 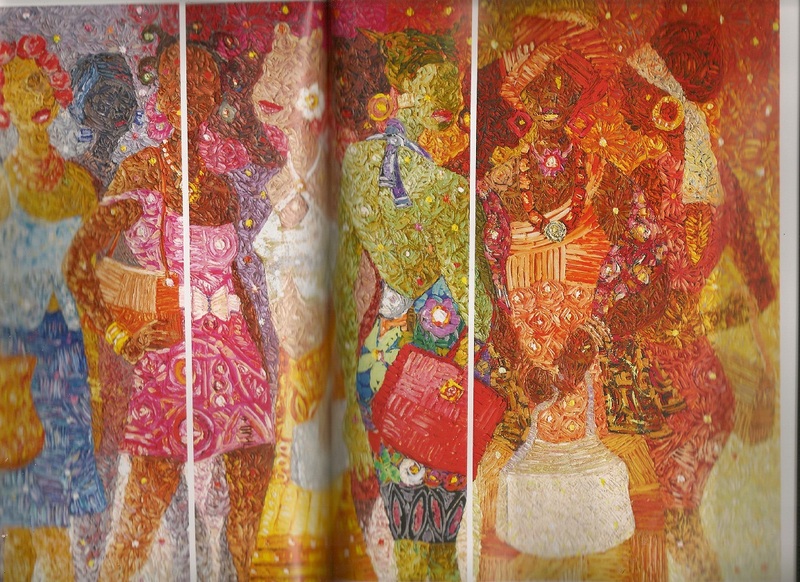 The works say something unique about the artist; that he is a Lagos city dweller who has over the years observed with kin interest, a lifestyle of regular weekend parties that is common with the city dwellers. Isichie has applied everything he has seen whenever these parties took place, to this colourful art piece. As is clearly seen, the women are gorgeously dressed, and they must clutch their handbags to themselves. Expressing habits that have become like a ritual, these women do not feel complete until they apply thick shades of make-ups. The lipstick colours are usually bright red with matching shades of paints for the cheeks and the eyes. Never mind, Isichie understands that these are labels that spice the blend. The complete details cannot be hidden as the women have carefully made hairstyles to match ; some wearing trendy wigs and others having on curls and dreadlocks. Their accessories are equally noticeable on their necks and wrists. Quietly, but noticeable too, is a touch of envy; one thing that seems to find its way into the midst of women, especially at fun times. One of the ladies is seen with mouth agape as she looks at another in front of her. She appears to be well- dressed too, but she just may be imagining how someone else could be looking more beautiful. This work no doubt captures the best representation of women situations. Created on three panels, there is an expression of confidence about what the artist is doing. Rather than opt for the choice of working on a large panel, the artist trusts his efforts enough that he would always create the desired sense of appreciation that is yearned for, even if they came in bits and pieces. Labels: Art Exhibition , City Dwellers , Literary , Nike Gallery , Rom Isichie , spotlight , Women and Style.